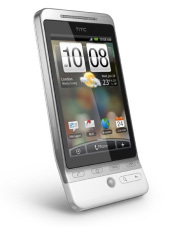 Does the HTC Hero Run Faster with Class 6 SDHC Memory?... Yes! Comparing to HTC Hero's side by side, one with the 2GB SD card that comes with the device and the other with the previously talked about 8GB Class 6 SDHC card, there is definitely a very noticeably difference. There are still areas that will gutter slightly, and I would still recommend using apps like TasKiller to keep the quantity of memory resident apps down, but when it comes to loading up or searching through contacts, albums, music, emails, text messages etc, there is a considerable amount of difference in responsiveness. If you have the Hero, I highly recommend getting an updated card. However, I do also hope that HTC will release updates to HTC sense to streamline some areas that obviously have room to improve. As for any other problems. I've spotted one or two very minor bugs that most users probably won't even pick up on, but the only big issue I've had is the IMAP support with the HTC Mail client. For the most part it is fine and works well, but I just happen to use hMailServer on my servers and just happens that HTC Mail client and hMailServer aren't playing ball. Luckily hMailServer has a very good lead developer (Martin) that seems keen to try and get the problem resolved.. Would be important I guess to get that done considering HTC is planning to replicate the whole HTC Sense software across their entire Windows and Android phone portfolio!! *fingers crossed* that will be sorted out! What do I think of the device? Amazing.. I've used everything from Nokias, iPhones, Blackberrys and various other HTC windows devices, and this one really just feels right. There may be tweaking to do, but its just way ahead on the usability of any other devices in its market. Anything I don't like? Probably only one thing if I was pushed for an answer. I wish that more of the apps developed for Android would close properly and take themselves out of the process and memory space when they simply have no excuse of being there. Android has the ability for more than one app to be running at a time, but I don't like developers getting lazy or exploiting the fact. Thankfully there are apps to help, but just means something else to do just because these people couldn't be bothered. The only other thing is the lack of BlueTooth stack support. Being able to push files and contact information would have been very useful. Lets hope for something in the Android "Donut" update. A particularly geeky post, even for me. As I wait for my Hero this morning I've been running some disk benchmarking on the micro SDHC memory cards I have around here. That is quite a significant difference between the devices. The 8GB Class 6 Micro SDHC that I purchased for the HTC Hero really looks to be exceptionally quick for a SS memory card. Baring in mind that smartphones are doing a lot of read AND writes to their main storage because of the wealth of applications, background processes and more over, swap file requirements, especially of the Android platform, I'm expecting this to have a significant difference in the general response of the phone. The swap file in particular will require plenty of read and write throughput when the device is in use, especially when the device is loaded up and is more and more reliant on that file. Luckily I'll have TWO HTC Heroes here today, which means I'll be able to do a side-by-side comparison between using the 2GB Class 2 (?) Micro SD card that comes with the device, and the replacement 8GB Class 6 Micro SDHC card. For the sake of £14.99 which included a small USB card reader it's barely a price to pay for what I hope to be a significant difference in user experience. After months and months of waiting around for a device that could really do everything I needed and more, and also opened me up to a new development platform and "play area", I decided to go with Android. There are so many devices coming out with this platform as their main UI OS, and each are as powerful as any other smartphone you can mention.. even that iPhone. All that competition means they are also half the cost of ones like iPhone. Its a recipe in my books for overall success in the long term. I'll happily admit that I'm not always right, but I'm going to be putting my money where my mouth is with this one. I should finally get my own next week and am already trying to work out which apps I want to try out from the huge Android Market app store. The HTC Hero seems to be getting a massive following, however some reviewers are already bitching for more processing power out of the phone as this device can multi-task, meaning that it is easy to overload unlike devices such as the iPhone where the smaller processor only needs to deal with a single application at a time. To me, its much more likely that these issues they experience is because they are loading up the phone as part of "playing" with it, and also because the new UI (namely HTC Sense) is still an infant. Looking forward to a bright and interesting future with this device! The smartphone war is heating up.. Ever since Palm brought out their personal organisers and mixed them up with phone capabilities, there has been a battle for the enterprise market. And because it was the enterprise market much of the battle was like some Mid-African conflict. You know its happening, but it doesn't get any focus of the rest of the world since to everyone else it does seem to matter who "wins". Now that Apple has come on to the scene and have worked their usual marketing magic, "smart-phones" seem to been brought to the attention of the little people, and with it a promise of amazing new ways to use the computational power of their once mundane mobile phones/devices. As the battle is brought to the front door, so is the limelight, and as more and more of the masses fall into the same sudden realisation of what these devices can for their lives, it is like they just experienced some sudden apparition. What a lot of people don't realise is just how long the war has been raging, though its only in the last year, may be two that consumers finally understand what part software plays when it comes to any electrical device. What is frustrating is that people got the idea that their iPhone has lots of programs to pick from that can suddenly make their phone become a toaster. They quickly finish their mocha coffees and then all "hail Apple for such an amazing invention". I suppose its probably quite fascinating and mind boggling if you have never realised that everything electrical in the home these days has some kind of ware helping make the device actually function. However, what is the most frustrating is that devices like the Windows PDA and Mobile, which was out some decade or so before Apple had that glimmer in the eye, also had more applications than you can wave a stick at. For the 50,000 odd applications for iPhone, there are 250,000 for windows, but that seems to have been lost somewhere in the hype (please keep in mind that when they say 50,000... 100,000... or even 1,000,000 applications, a massive percentage of that are probably apps that do just the same thing or just barely do anything at all). I'm not meaning to sound all pro-windows here. Microsoft once again had a monumental chance to take all the cream, but no-doubt were once again totally engrossed in what everyone else was doing they forgot they had to come up with ideas too. My point here is that applications are important, and what your smart-phone can do for you is really all about what developers have done for your device. And this brings me on to a new contender in my own personal decision in which side I'll take in the smart-phone war. I'm not choosing a smart-phone because I can turn it into a fish tank or a drum kit. Such things are completely crap after 20 seconds and moreover totally unfulfill a reason I have a smart device. Because there are so many device and choices out there these days means I can be a lot more selective about what I'm actually after, and I think if you are looking at what smart-phone you really want, you should ask your self the same questions. Spending 400-500 quid for a phone (or more than twice that if you got suckered into buying the iPhone, fool) you have to make sure you are really buying the right ones. So far there are the Symbian (Nokia), iPhone, Windows Mobile, WebOS (Palm) and Android (Google) that make up the smart-device platform top dogs. I have to point out that the lines between them are really blurring out as they get more and more alike, apart from Symbian which is quickly looking outdated but its also the oldest and more estabilshed meaning that it just does the job it is required to do bloody well and without all the frills. Recently I've been looking at the HTC Hero which is based on the Android platform, and I was always skeptic about it in the past. I didn't like love the interface. Then again, I also hadn't really looked at it in more detail than the homescreen features which is about where most reviews and demos seem to get hung up on with most devices. What I missed was that this platform was actually really good for my needs. I do more email and web browsing than phone calls and texts (by a hefty difference I'd like to point out), and this platforms improved interface by HTC, its already reasonable email support and its excellent web browser (tests show vastly better than Windows and iPhone) has really grabbed my attention. Filling in the small gaps is important to me and definitely gets me swaying heavily in favour of any platform, and the third party application support for this considerably new OS has is showing massive promise (Several thousand already). There isn't a single app out there that I can't find to fulfill my needs, and most of them are free or half the cost of iPhone apps or quarter of that of Windows or Symbian. This could be because of the push for open source development Google has been doing, but what ever it is, its working. What I am surprised about is the cost. I was expecting it to be cheaper than the latest HTC windows counterparts since the platform isn't licensed like Microsofts (still almost half that of an iPhone I'd like to point out again). But it does have a few differences such as the 5 megapixel camera, the 3.5mm headphone jack, the digital compass and the capacitive rather than resistive screen (though lower resolution which was disappointing to see! It has the same resolution as the iPhone). These might push the costs back a little, but I think it was more down to a business decision for equilibrium across their product line than actually overall manufacturing cost. Pitty if that was the case, but understandable. I'm looking forward to getting my hands on one for a proper test, much like I am still for the Palm Pre, and finally getting to write a conclusion to this long long debate.